What do farmers think about planting riparian margins? 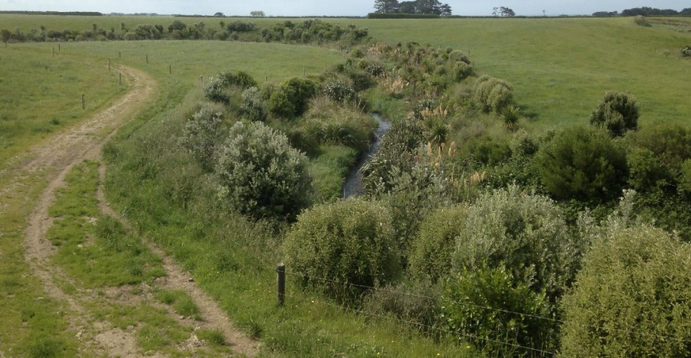 Fleur Maseyk and her team from the University of Queensland surveyed a group of dairy farmers working on the Taranaki ring plain in New Zealand to learn more about their perceptions of the value of riparian plantings. Farmers were invited to participated in an interactive meeting with the purpose of describing their experiences and views on the costs and benefits of planting riparian margins on their farms. Following European settlement in the mid-1800s, the once forested plains around Mt Taranaki (one of New Zealand’s most iconic volcanoes) were rapidly converted into pastoral landscape dominated by exotic pasture species. This transformation made Taranaki a nationally important diary region. In the process, native vegetation was reduced to less that 10% of its former cover. The benefit of food production had come at a considerable cost to native biodiversity and the provision of a range of other ecosystem services. 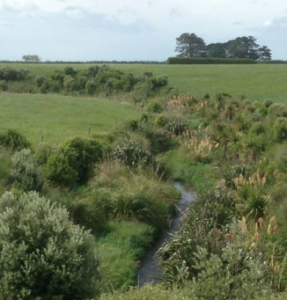 In 1993 the Taranaki Regional Council initiated a voluntary planting program to restore vegetation to riparian margins with an aim of maintaining water quality. Twenty years on, Maseyk and her team were interested in finding out how farmers perceive the costs and benefits of undertaking riparian planting. Two groups of farmers participated in the meetings; Group A (17 farmers) who have or are implementing riparian planting and Group B (5 farmers) who have fenced, but not planted their riparian margins. Group A farmers opted for planted margins. This image shows multi-tier planted margins. Group B farmers used fenced grass strip margins as shown above. Not surprisingly, the two groups of farmers had quite different perspectives, with Group A perceiving 21 positive aspects and 11 negative aspects associated with riparian margin plantings, and Group B perceiving only 15 aspects, all of which were negative. These pros and cons fell across production, environmental, and social values (Figure 2), and show that our participant farmers are thinking about additional ecosystem services and benefits beyond water quality as well as trade-offs. Taranaki dairy farmers review the issues regarding riparian margins raised during the group discussion. From our structured discussions we found hat while Group A identified many benefits from planting riparian margins, they also shared some common ground with Group B in recognising associated costs and liabilities, such as the loss of production land, and increased weeds and pests. However, Group A suggested that many of these issues can be balanced by positive aspects of riparian margin plantings. For example, they observed that cows will graze longer in the shade provided by riparian plantings (which means more milk) and this can be enough to make up for the loss of production land. In contrast to Group A, Group B farmers were disinclined to plant their riparian margins as they did not think that there were any additional benefits to be gained that could not be achieved by fenced-only (grass strip) margins. Indeed, both groups observed that fencing excludes livestock from waterways, and allows for greater precision mapping of the farm, improved rotational grazing, and better allocation of feed. The farmers observed that not only did fences prevent their livestock from falling into, or getting stuck in waterways, they saved them money (by avoiding livestock injury or loss, labour time to retrieve animals, and damage to farm equipment used in retrieval), and increased the safety of farm staff who were no longer retrieving animals from waterways. Critically, Group B identified that neither grass strip or planted multi-tier riparian margins can address sub-surface nutrient flows. Consequently this group of farmers felt the objective of the planting program – to protect water quality – was misguided, and this view obscured the recognition o fall other potential values and benefits of planting riparian margins and prevented them from implementing planting on their farms. However, the survey found that farmers who had planted as well as fenced riparian margins experienced increased benefits from both farm performance and environmental enhancement. 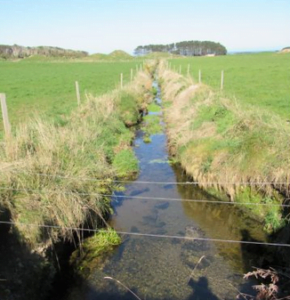 he pros and cons of fenced-only grass strip riparian margins (Panel A) and fenced and riparian margins (Panel B) as identified by Taranaki ring plain dairy farmers. This article was adapted from Decision Point Online. Working with farmers to manage and improve riparian land is a key aspect to our Rivers of Carbon projects, and we have plenty of free resources about effectively managing riparian land, increasing agricultural productivity and stock management. Please follow the links to explore the resources and download them for free!